After finishing his second Boston Marathon five years ago, Maj. Ken Parisi, a logistics specialist at Marine Corps Systems Command, wanted to tackle a new challenge – triathlons. He has completed four full-distance 140.6-mile races and 10 half-distance 70.3-mile races. He said this passion for triathlons gave him confidence and made him a better Marine. “I realized I got myself into something pretty big, so I did what all Marines would do—I made a plan, hired a coach, bought a bike, and then just actively and aggressively pursued my training plan until I crossed each finish line,” Parisi said. This fall, he participated in the Ironman 70.3 World Championship at Nelson Mandela Bay in Port Elizabeth, South Africa, placing in the top 25 percent of 4,500 competitors. The race included a 1.2-mile swim, 56-mile bike ride and a 13.1-mile run. It was Parisi’s first World Championship race, and he had to overcome a few obstacles: it rained the entire race and his bike never arrived in time after he shipped it from the U.S. Luckily, he was able to rent a bike and was only six minutes short of his fastest time. He also beat his personal record in running by six minutes and matched his fastest swim time. Parisi said training for a full-distance Ironman consumes his off-duty time. He alternates between swimming and running one day, then biking and running the next day, training at least 14-18 hours a week. This does not include the time he spends on travel, preparation, cool down, stretching and calorie consumption. Parisi said he believes competing in distance triathlons has increased his endurance and strength, which makes him a better Marine, even after 23 years of service. He earned a perfect score of 300 on his physical and combat fitness tests, and is more driven and disciplined to conquer every goal he sets. 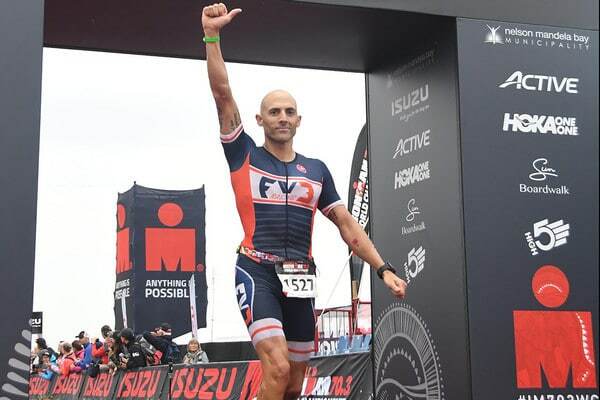 Parisi will continue working toward his goal to compete in the Ironman World Championship, a 140.6-mile journey, which is double the distance from the Ironman in South Africa.